Skype's dealing with Verizon signaled possibly an early demise for VoIP capability over 3G on the iPhone version of the app. Users have been waiting for what feels to be like an eternity at this point for Skype to finally let out this one feature that users have been hungry for. The latest update places the Skype app for the iPhone at version 1.3.1 and simply adds support for iPhone OS 3.2 and the iPad – as usual, it offers only some bug fixes and compatibility updates. Clearly at this point it's apparent that Skype may be ditching their efforts now that they've signed a done deal with Verizon – that's unless of course Big Red happens to see an iPhone down the road. It's almost difficult to imagine that other apps like Fring, iCall, and Truphone seemingly allowed VoIP over 3G since AT&T gave the green light back in January. 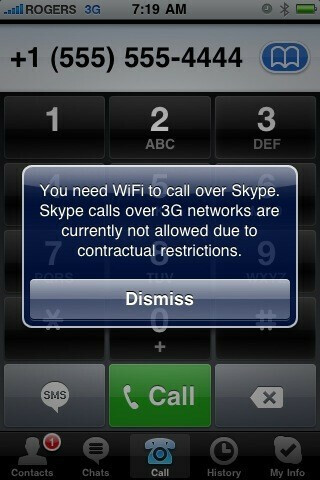 Nonetheless, iPhone owners can always resort to using Wi-Fi if they truly need to call someone through Skype.